It's happening, I'm going green. Or as green as I possibly can. There may be the odd thing here and there that might be difficult to part with, but I have officially said goodbye to my much loved Clarins Lip Perfectors and if I can do that, I think I might be able to do anything. Green beauty is a whole new world to me, very overwhelming but incredibly exciting. Here are a few things that have caught my eye so far. 'A light eye cream to stimulate collagen production and reduce the appearance of lines in all skin types.' Sounds promising and although I'm not sure if this is the one I will ultimately go for, a good eye cream is top of my to-buy list. 'A creamy fragrance-free intensive moisturiser for sensitive and dry skin.' I really like the Sukin moisturiser I'm currently using, but it's not quite hydrating enough. Over the past few days I've read approximately a million reviews of many different moisturisers and I keep coming back to this one from Weleda. 'A natural stain for long-lasting cherry red colour, with rosehip extract and organic beetroot pigments to brighten your skin.' This looks like it would be a colour I would adore and wear all the time in the colder months. 'A blush compact that gives the option of a natural matte finish, or a radiant healthy glow.' Something I definitely don't need but you know me, I'm always drawn to pretty cheek products. I've been a neutral lover for a long time now, but I'm beginning to be drawn towards peach shades again. 'A lightly tinted stain that combines hydration and protection with abundant mineral colour for a beautiful, natural finish on lips and cheeks'. A truly good multi-tasking product is a bit like a magical unicorn. Rare. Will it look as nice on the cheeks and it does on the lips, or vice versa? Who knows. Looks like a stunning colour though. 'A skin perfecting, illuminating concealer/light foundation for the eyes and face to give the skin a more youthful, radiant glow while hiding any imperfections.' Sounds perfect, give me a giant pot that I can dip my whole face into. 'A uniquely gentle, non-greasy liquid foundation incorporating oats for a nourishing consistency with medium coverage.' Finding a foundation that sits nicely on my skin is tricky at the best of times. I did really like the Lily Lolo BB Cream but no matter how I apply it it just looks streaky and bunches on my skin, which is currently drier than a desert. 'A unique blush brush that ensures that colour is pressed into the skin to create an airbrushed effect.' I'm not sure how unique a brush can be, but this one does look very lovely indeed. Any green beauty advice, favourite websites, anything at all would be much appreciated! I like using rosehip oil, it really helps moisturising my dehydrated skin. I have to try this Weleda cream though, I never had anything from their almond range and I love the brand. Definitely going to invest in some rosehip. I haven't tried anything from the almond range either, but everything else from Weleda I've enjoyed. Seems like a great all-round brand. Ooh I'll have a look! I've seen some of their products somewhere before! 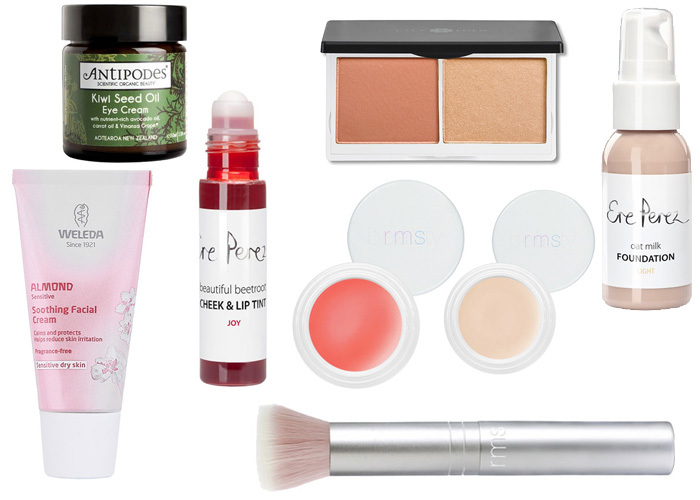 I really like the sound of the Weleda moisturiser, and that blush brush is so gorgeous! ♥ Good luck with your green beauty journey, Jennie! Antipodes is one of my favourite skincare brands, if you haven't already then try out the cleansers. I'll look into them for sure. I'm looking forward to discovering some new brands! Oo I've not heard of Green Beauty before, sounds intriguing! You've definitely just tempted me by the RMS Beauty 'un' cover up!